This magnificent three bedroom apartment in Barcelonat, situated in the centre of Sants, right near Plaça España and the Fira de Barcelona, is an excellent choice for those heading to Barcelona for business or pleasure. It has been recently remodeled and has a total area of 130m2. This neighbourhood offers easy access to all of the sights in and around Barcelona from the historic downtown to the beautiful beaches, ensuring that you have the chance to explore all the corners of this city! Hostafrancs metro station is situated just 200m from this apartment, from here you can reach Plaça Catalunya and the centre of Barcelona in minutes. 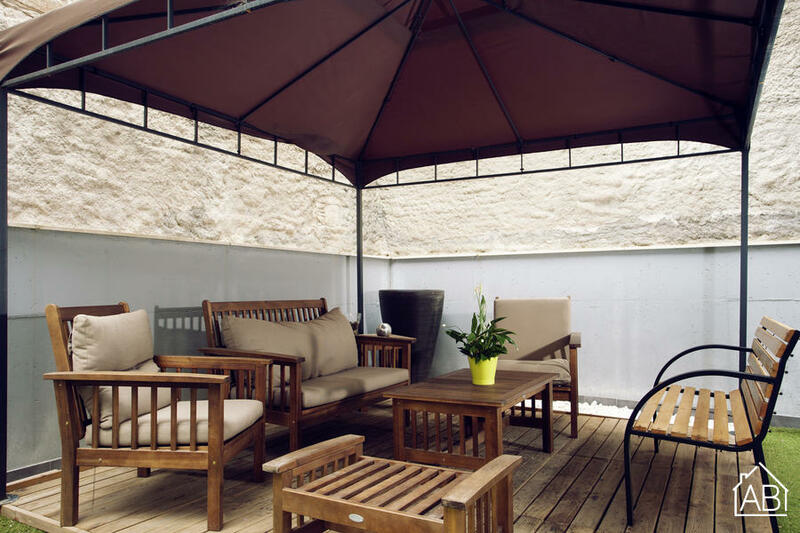 In addition, the Sants train station is just 5 minutes away from the apartment. This property is located on the ground floor of a building with lift and is distributed in 3 different levels. On the first level there is a spacious living room decorated with floating lamps and has TV, sofa and stools, where you can relax. Here you will also find a spacious dining room with a large table to accommodate up to 10 people. The kitchen has a direct access to the stylish, 35m2 private terrace, with functional teak furniture and a gazebo complete with comfortable furniture creating a great place to relax with family and friends. On the lower level there are two cozy and completely separate rooms thanks to a sliding door, which will provide necessary privacy. There is a practical double bed sofa and two single sofa beds to accommodate 4 people. This level has a bathroom with a sink, toilet and shower. The upper level is divided into two bedrooms. The first has a double bed and the second one has a bed and a sofa bed. This level also has a bathroom with a sink, toilet and shower. There are two sofas in this apartment and a TV, making it easy to relax after a day of exploring the city. With a fully-equipped kitchen, budding chefs will be able to prepare some delicious Spanish inspired meals in the comfort of this home-away-from-home. There are a lot of shops and restaurants in the district as well as a wonderful local market. A Nespresso coffee maker can be provided if requested, allowing you to enjoy a great cup of coffee on the terrace in the morning! This charming apartment, complete with air-con and central heating, is the perfect place to call home during your trip to Barcelona any time of the year!